An "exceptionally rare" silver sword mount has been declared treasure. The early medieval or Saxon artefact was found by metal detectorists around Culmington in south Shropshire. It dates from between the sixth and early seventh century and its function is uncertain, but experts say it is likely to have been used to keep a sword in its scabbard. Finds liaison officer for Shropshire, Peter Reavill, said it was "immensely important for the county". It is thought the mount would have been used to help secure a sword in its scabbard, using a strap running through a bar on its base, Dr Sue Brunning, curator of the European Early Medieval Collections at the British Museums said. Mr Reavill added: "Since the discovery of the Dinham Pommel more than 20 years ago, which is housed in Ludlow Museum, objects related to swords are exceptionally rare." The Dinham Pommel is a cap believed to have been stripped from the end of a small Saxon sword or dagger. The mount was declared treasure by coroner John Ellery at an inquest at Shrewsbury's Shirehall on Tuesday. 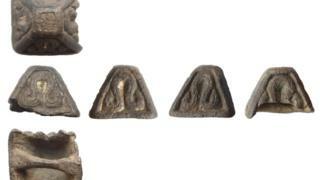 It will now be independently assessed by the Treasure Valuation Committee which will decide its market value. Shropshire Museums will then be given the option to acquire it, and monies raised will be shared jointly between the finder and owner of the land where it was discovered. Lezley Picton, Shropshire Council's cabinet member for culture and leisure, said: "This find further demonstrates the rich history of Shropshire and the stories we have to share and I'm excited to see what else has yet to be discovered."